Polarized sunglass lenses remove reflected light, reduce glare and filter harmful ultra violet radiation. Many people feel as though they want a very dark sunlens because their eyes are sensitive to light. It is however, usually the reflected light that increases the wearer’s sensitivity. Light bouncing off of water, snow, the roadway ahead, even the hood of a car can be distracting and even dangerous. Ultra-violet light is more than twice as intense when direct radiation is compounded with reflected glare. The efficiency of the polarized lens allows the wearer greater comfort and protection without the restrictions of a darker colored lens. 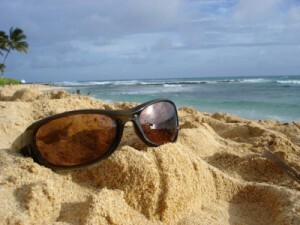 Polarized sunwear protects your eyes from the burning rays of the sun. A polarized lens acts as a vertical venetian blind, selectively blocking light reflected from horizontal surfaces. There are many features associated with quality polarized lenses, with your prescription or without, when they are mounted in ophthalmic frames. Polarized lenses eliminate glare, enhance color perception and accentuate contrast improving vision. Polarized sunglasses protect your eyes from the harmful, burning rays of ultra violet light protecting your retina and slowing the formation of cataracts. Prescription quality ground and polished lenses eliminate visual distortion. Quality frames are more durable and when professionally adjusted, stay where you want them, making you more comfortable. For better vision, better comfort, better protection you can trust the professionals at Parrelli Optical®.